I have a minimum order of £200. Prices are based on the number of servings and level of design work involved. A 50% retainer is required to secure your booking and final payment is due one month before the event. How far in advance do I need to book a cake? We take bookings up to 2 years in advance and popular dates get booked up quickly for high season, so as soon as you have the date of your event please don’t hesitate to enquire. Yes, we deliver all over London and the home counties. Delivery and set up is an additional fee and based on mileage. Deliveries are free in Bromley. Pick up is available for single tiered cakes only. Can you copy a picture of a cake I’ve seen? We would love to learn more about you and your event first to give you a bespoke service. It’s great to have inspiration and an idea of what you would like but we don’t do exact copies of other cakes. Yes, this is usually a 3-day service. We also hire out a cake knife and server if your venue doesn’t provide one. Do you hire out your doughnut wall? Yes, we have two doughnut walls depending on how big your event is. Hire starts at £50 for 3 days. Email ask@cakemeup.com for more details. Do you offer free from cakes? Not at this time, however we work with other suppliers to provide alternatives for guests with specific dietary requirements so just ask. All cakes come with allergen information. How do you cut the cake? Your cake will come with a slicing and portion guide. Yes, although a more popular choice is to order a tasting box which is sent through the post, then correspond over email and phone. If you go on to order your cake from us, the price of the tasting box is taken off the final price of your cake. 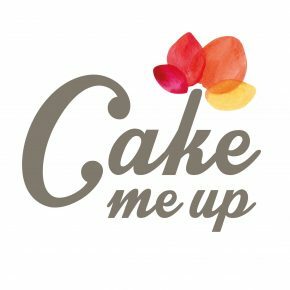 Please email ask@cakemeup.com to order your tasting box. Do you make sugar flowers? Yes, we use either sugar flowers, or fresh and organic edible flowers on our cakes.